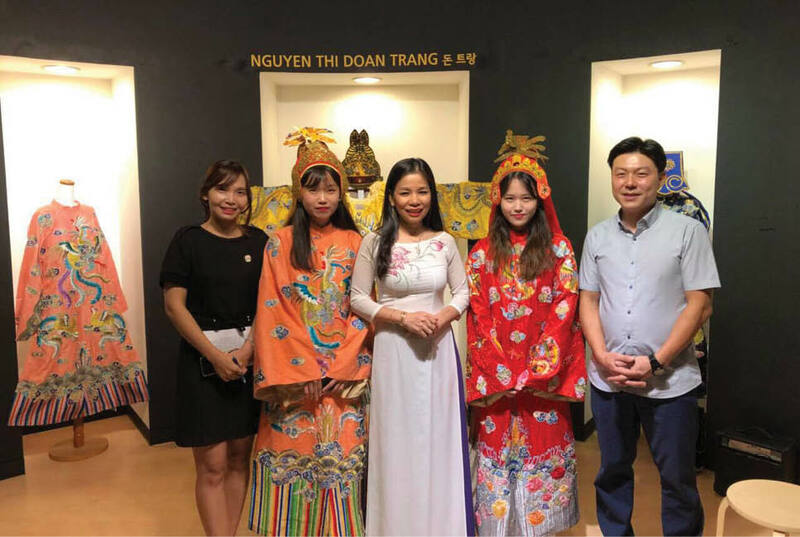 Invited by Cheongju City Museum of Art (South Korea), in September 2018, three Hue artists brought along their traditional Hue products, namely royal costumes, wood sculptures, and pháp lam (enamelware) to introduce the culture of the Ancient capital to the land of Kimchi. 1. With more than 20 years of dedication to Hue enamelware, for the first time, Thai Hung Co., Ltd. led by Do Huu Triet and his students, introduced their first collection of enamelware to the land of Kimchi and received the warmest welcome of the local people there. Here, the Viet-Korea cross-cultural exchanges were clearly reflected in each product, the decoration style, or through the tours to traditional Korean craft villages. 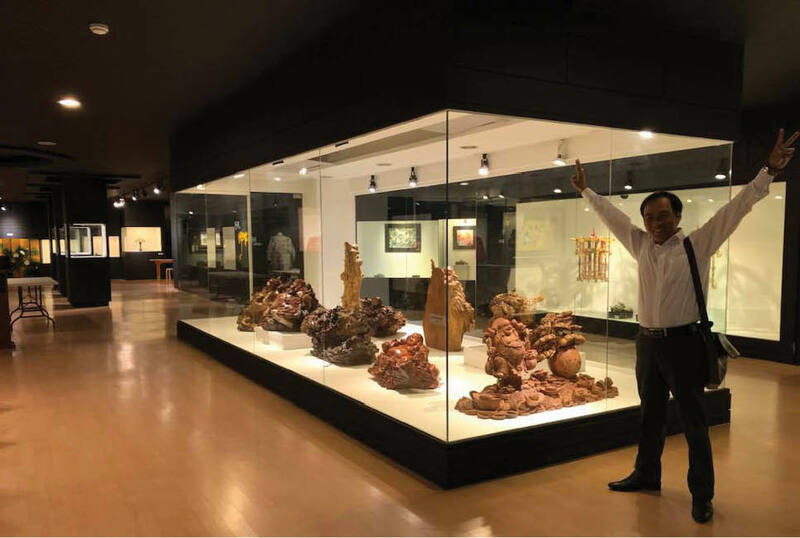 Graduated from the Department of Physics, Hue University of Science, with a strong passion for traditional craft, Do Huu Triet has chosen to work for Hue Monument Conservation Center for a long time. The years of studying and restoring relics have inspired him to pursue and preserve enamel bronze arts, which later became his topic for master thesis defense. With 20 years of experience, his company has now launched three flagship products and services: tourist souvenirs, enamel paintings, and enameled interior decoration including enameled sketching, enameled edging, enameled wood, and glass, with over 700 products. Despite its Chinese origin, enamelware was adopted by the Hue people relatively later than other parts of the world, but enamelware "made in Hue" were distinctively crafted in a more skillful and creative way, and the one who revived the lost craft of enamelware was Do Huu Triet. With a unique blend of tradition and modernity, hundreds of Thai Hung branded products for worship, souvenir, and decoration have been crafted, creating a brand name for Hue enamelware and fostering tourism opportunities with tours to the craft space at the company's workshop. According to the director of Thai Hung Co. Ltd., Do Huu Triet, enamelware is produced by the integration of many handicrafts such as jewelry, metal carving, pottery, ceramics, and bronze casting. It is the harmonious combination of traditional handicrafts that has made Hue enamelware unique and diverse, as each product holds its own distinctive values. 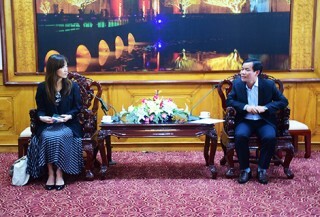 Therefore, the trip to Cheongju city is an initiative to foster cultural exchanges between Vietnam and Korea and enhance the connection between the two cities of Hue and Cheongju. Here, representative products of Hue enamelware such as paintings, lights, ornaments, vases, and teapots were proudly displayed, and were appreciated by both locals and visitors. 2. “Passionate, dedicated, and incessantly creative” are fine words to describe Nguyen Thi Doan Trang, an artisan who restored royal costumes. Started as a foreign language teacher, she later quitted the job and followed her burning passion for ao dai and Hue traditional crafts by becoming a designer and founder of a tailor and embroidery private enterprise on Bach Dang Street (Hue City). She never ceased to study and create new outfits, from embroidery to tailoring ancient and modern ao dai designs. Yet it was not until 2015, after years of cherishing her dream to restore Hue royal costumes, that Doan Trang invested 100 million dong to design a collection of royal costumes to “showcase Hue by the ancient ao dai”. 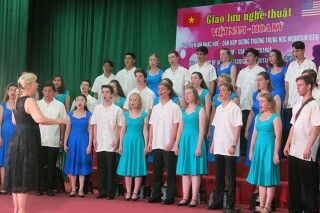 In the years 2015 and 2016, this collection was performed in Malaysia and Hanoi Capital, and presented in an exhibition at Cheongju city Museum of Fine Arts (South Korea) in September 2018. According to Doan Trang, after two years of restoration and sophisticated design process, the complete collection of Hue royal costumes was composed of 15 sets, with the ranks starting from the King, the Queen, the Queen Mother, the Prince, the Princess, to civil and military mandarins, high-ranking mandarins, eunuchs, maids, and soldiers. 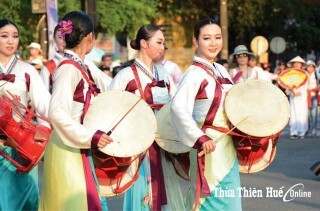 In Doan Trang's mind, Hue is a festival city with annual important events, so she wished to provide younger generations a better understanding of the royal costumes worn by the feudal nobles. With this end in view, she restored the quintessential skills of ancient artisans and reformulated the entire concepts used in royal costumes. The products of Hue artisans were shipped to Korea by sea and were specially displayed in a glass room, attracting thousands of locals to visit, learn, and take photos. 3. With more than 15 years of teaching expertise in wood carving, artisan Truong Dinh Phuong serves a dual role as a lecturer in the Center for Vocational and Continuing Education of Hue city and as the owner of Truong Dinh Phuong wood carving workshop at 119 Van Xuan St. (Hue City). He holds the honor of being one of the three artist participants in the exhibition at Cheongju Museum of Arts. Here, six large statues weighing tens of tonnes including a Confucius statue, a Bodhidharma statue, and four statues of Maitreya Buddha with triple lucky YuanBao Boys were elaborately carved and transported to the exhibition at Cheongju city. Wood carving is a traditional handicraft that characterizes Hue architecture with its high artistic values and the creator’s honorable professional skills. In particular, the carving expertise in seamless blend with aesthetic sense and skillful hands of the craftsman created wondrous objects using only the common tools such as saw, chisel, and drill. Hue is the cradle of wooden art and wood sculpture with hundreds of artisans and skilled workers, but what makes the maker of these exhibited statues special is that he is the teacher of disabled children and orphans who have been sheltered and taught by his company over the past years. With a hope of introducing the distinctive values of Hue and Asian culture, artisan Truong Dinh Phuong has created his own tools to craft sophisticated and unique products. He focuses on exploiting the natural wood texture to come up with ideas for making high-quality and aesthetic products. “Throughout the days in Korea and the short visits to some traditional villages here, we learned ample valuable experience. In Hue, most artisans are very young, enthusiastic and passionate about their job, whereas in Cheongju city, the craftsmen are mostly over 70 as the younger seems less interested. 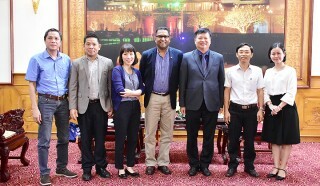 After the trip, we set a friendly relation with the city’s government whose leaders attended our conference on “Intangible Cultural Heritage in Asia-Pacific region 2018” in early November 2018 and promised to join the 2019 Traditional Craft Festival held by Hue City People's Committee," said Truong Dinh Phuong. 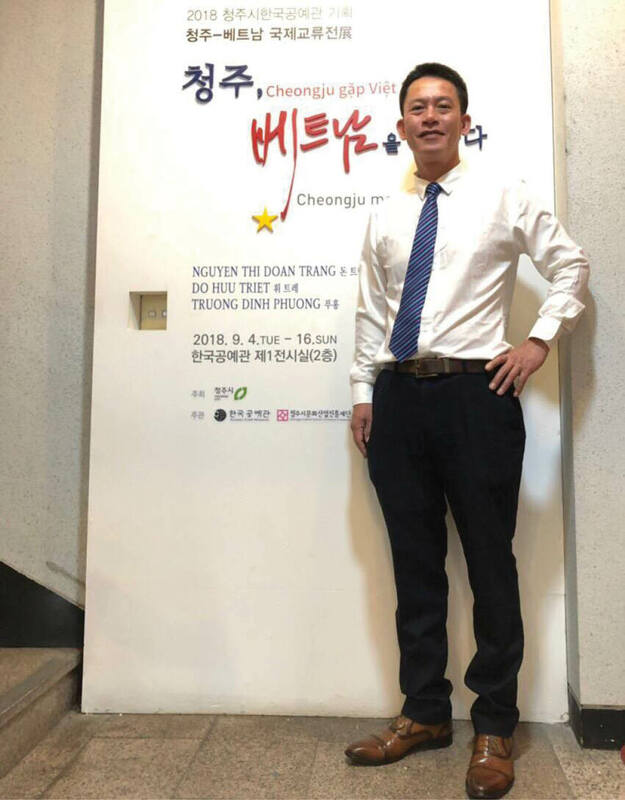 Manager of Cheongju city Museum of Fine Arts, Mr. Koh Yoengchan said that after visiting Hue - local production facilities for traditional handicrafts, we have selected three groups of products that bear certain similarities with Korean culture and invited their relevant artists to the exhibition. 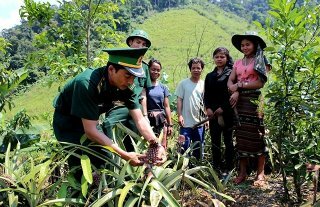 During the stay, the artists have impressed the mass and Korean artisans alike by presenting rich-in-culture products of Hue and Vietnam such as royal costumes, wooden Buddha statues, and enamelware paintings. Photos credit to the artisans.